Sometimes you might go to a shop and in spite of protests handed a plastic bag. The bag will perish naturally, the shop attendant might tell you. In the past three years, different kinds of plastics claiming to be biodegradable, have entered the Indian market. But most of these brands that sell such bags do not meet Indian standards. The ones that do pass the test, are also being questioned as authorities are not equipped to test for 100 per cent degradability. 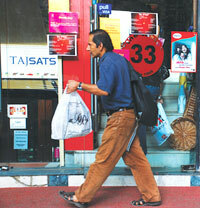 In September 2009, the Union environment ministry proposed the Plastic (Manufacture, Usage and Waste Management) Rules. These rules describe biodegradable plastics as “ones that can be composted to leave only organic material”—plastics that degrade through biological processes to yield carbon dioxide, water and biomass, and leave no toxic residue. For testing these plastics, the rules have prescribed the BIS benchmark. For a compostable plastic, the benchmark is that a minimum 60 per cent of the polymer degrades within 45 days. In 2009, the Central Pollution Control Board (CPCB) tested plastics claiming to be biodegradable. Four of the nine samples taken fr om manufacturers, restaurants and hospitals in and around Delhi passed the test, said S P Gautam, chairperson of CPCB. The CPCB report identifies two kinds of plastics, which claimed to be biodegradable but only partially so— oxo-degradable plastics, which break down when exposed to sunlight or oxygen, and semi-biodegradable plastics blends of plant starch and polyethylene (polymer used for polybags). Oxodegradable plastics only break into smaller bits, which remain in the environment. They leave traces of cobalt, lead or manganese, research by the European Plastics Recyclers Association showed. In semi-biodegradable plastics, only the starch component decomposes. When “biodegradable” bags were introduced in America in the 1980s, it was found that polyethylene strains remained in the compost, hindering plant growth, said CPCB report. “These plastics remain in a fragmented state for years in the environment, making them as toxic as normal plastic,” said Bharati Chaturvedi, a member of the expert group set up by the ministry to examine the draft plastic rule. As against the consumption of eight million tonnes of plastic in India in 2009, about 300 tonnes of compostable plastic and 5,000 tonnes of oxo-degradable plastics are consumed annually in the country, said Perses Billimoria of Earth Soul Limited, which has got BIS certification. The reason is that oxodegradable plastic sells between Rs 90- 120 per kg while compostable plastics films/bags sell between Rs 400-500 per kg. Earth Soul imports starch from vegetable oil derivatives. “Compostable plastic uses plant starch as raw material that is imported since the Indian market is not big enough to set up a facility to pro cess plant starch,” Billimoria added. India’s limited composting facility is also a concern, said Shyamala Maini, member of working group on plastic waste. The environment ministry estimates that India has a capacity to process about 6,000 tonnes of mixed waste into compost per day whereas about 10,000 tonnes per day of plastic waste is generated in India. Chaturvedi questions even starchbased compostable plastic as the mystery remains around the remaining 40 per cent of the plastic, for which degradability test has not yet been conducted by CPCB, she said.